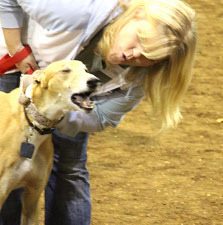 Racing greyhounds are generally a healthy breed and susceptible to few of the genetic disorders that plague other purebreds. Because not all vets are current on greyhounds, and because you will be your hound’s caregiver, it’s important to understand what’s normal and what’s abnormal. Hemoglobin/Red Blood Cell Counts – These are consistently higher than other breeds. Calcium, magnesium, thyroid (T4), serum protein, globulins and B12 are consistently lower than other breed normals. 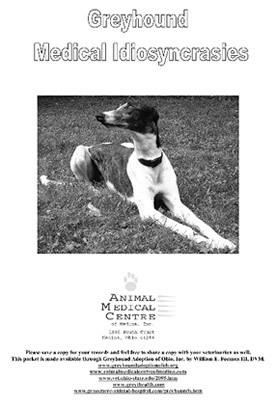 Heart Murmur – More than 80 percent of greyhounds have a mild left-sided murmur due to the high viscosity of their blood and its speed of ejection from the heart (2-2.5 meters per second). 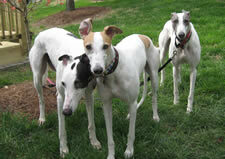 Blood Pressure – Higher than other dogs at 160-180, and even 200 mmHg. Drug Responses – Because greys have a significantly lower level of an important liver enzyme, they can have an unpredictable response to drugs, especially when multiple drugs are administered.